The first Heritage Race will be co-organized in Singapore with the Ramada & Days Hotels Singapore at Zhongshan Park. To be held June 12, it will cover a route around the Balestier Heritage Trail and participants will have to uncover 20 identified heritage sites in the district. Each participant will be given a guide and a map. The race will begin at 12 noon at the Ramada Singapore ballroom where participants will convene and be briefed about the rules of the race. The key objective is to visit as many of the 20 heritage attractions identified in the Balestier Heritage Trail as possible and to collect stamps along the way as proof of visitation. (Details of the race will be announced closer to the date). The entry fee is $30 per person and every cent of this fee will go towards our designated charity. Numbers are limited so please book your place fast. From sugar cane plantations to shops filled with sweet and savoury delights, Balestier is an area that offers a taste of history. From tigers in the woods to temples with deep roots, Balestier Road tells a tale that spans nearly 180 years and has borne witness to Singapore's remarkable journey from a British trading post to a modern city-state. Today, Singaporeans make a beeline to Balestier Road to feast on chicken rice and bak kut teh. Others come for a wide selection of goods to light up their homes and add sparkle to their bathrooms. But behind the five-foot ways that still line much of Balestier Road, there are other discoveries to be made. This district was where key moments of the 1911 Chinese Revolution were hatched and classic Malay films were shot, where coffee was, and is still, brewed in the traditional way and conversations shared over freshly baked loaves of bread and flaky confectionery. 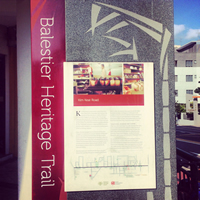 A joint effort by the National Heritage Board and the Urban Redevelopment Authority, and supported by the Moulmein Citizens' Consultative Committee and the Whampoa Citizens' Consultative Committee, the Balestier Heritage Trail is a result of extensive archival research as well as interviews with residents and business owners who have witnessed the growth and development of Balestier Road. We hope this guide will serve as a reminder, or even an occasion for rediscovery, of Balestier's rich heritage for both residents and visitors. Experience for yourself the charm and colours of a place that has seen tremendous change and yet remains a thriving reminder of Singapore's past and people. Lee Ah Mooi Old Age Home was established in the mid 1960s by the late Madam Lee Ah Mooi. She was a registered nurse in the Singapore General Hospital during the 1930s and experienced the hardship of the Japanese Occupation when the hospital was seized by the Japanese forces to function as the Japanese military’s primary surgical centre in Southeast Asia. The nursing home started out to provide nursing care for the Samsui women and Ah Mahs whose hard work contributed to Singapore’s development, both as a colony and as a nation. As most of them took vows never to marry and hence did not have off springs to take care of them, Madam Lee Ah Mooi took it upon herself to take care of them by taking them into her own home at Kampong Chong Pang. However, her neighbours were against it as they did not want sickness and death to be so close to their homes. This forced Madam Lee and her residents to leave. The next two to three years, they wandered around Singapore, from Telok Blangah to Kampong Teck Whye, seeking a place to house all the residents before finally settling down in Jalan Kayu for the next 13 years. The accommodation grew increasingly limited which then saw its final move to the present premise (formally Lee Kuo Chuan Primary School) in 1984 with the support of the late Mr. Lim Kim San who was known for his contribution to the development of the Public Housing programme in Singapore. 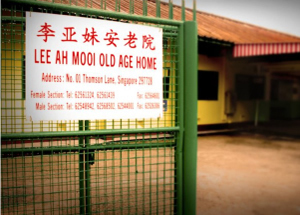 The premise is currently leased from Singapore Land Authority under the Temporary Occupation License (TOL) on a yearly renewal basis and hence, the nursing home might be relocated or even demolished at a short time’s notice. Together with her family members, Madam Lee Ah Mooi helped to provide skilled nursing care and rehabilitation services to people with illnesses, injuries or functional disabilities. After the passing of Madam Lee in 1992, the nursing home was passed down to her two sons, Mr. Then Mun Wah and Mr. Then Mun Tat, who continue to manage the home together till today. 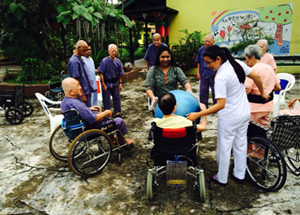 Currently, the Home is a private nursing home that does not receive any subsidies from the government and as the Home is catered for low-income to middle-income families, it has been absorbing rising costs for the food and medical needs of the residents. Still, it remains dedicated to provide high quality healthcare services to 110 aged residents who are in their twilight years. The Home also has 8 ‘resident workers’ (residents abandoned by their family), who are provided with free food, lodging and medical care. These ‘resident workers’ have been staying with the Home since early 70s when the late Madam Lee adopted them when they were young. The nursing home is different from other profit-driven home as its mission is to provide quality nursing care at affordable price. In fact, the monthly fee for staying in the nursing home is approximately 30% lesser than what some other nursing homes are charging. As costs of running the nursing home have increased, the Directors have been doing their best to ensure that the residents and their families would not bear the brunt of it through cost-effective measures without compromising the quality of nursing care. The Home also offers special subsidiary rates for families who cannot offer to pay the monthly fees and are rejected by governmental organisations because they have failed the means testing for staying at government-subsidized nursing homes. Funding is portioned out from these monthly payments but more often than not, there would be default in payments. Engaging in legal means would only increase the Home’s costs and sending the residents back to their homes is not a viable option because most of the time, the families would neglect them. In any case, the Home strongly believes that providing quality nursing services and catering to the needs of their residents as top priority because most of them are spending their twilight years in the Home. As of 1st August 2012, Lee Ah Mooi Old Age Home has been approved as a private nursing home with portable subsidies. Although the nursing home fees for subsidised residents will increase substantially, the out-of-pocket payment will be a lot lesser than what they were paying as private patients. The government absorbs the goods and services tax for subsidised patients whilst the nursing home provides the additional support where necessary. With the proceeds from The Heritage Race Singapore, we hope to help the Home carry on the legacy of the Madam Lee Ah Mooi in providing affordable and quality nursing care services to the Singapore population. We thank our race partners in Singapore for joining us in this fun and worthy event. Thank you Havas Worldwide for helping us create the buzz.